For those unfamiliar with the 1955 Cold War satirical novel and movie titled, 'The Mouse That Roared,' the premise was based on an imaginary country in Europe that declared war on the U.S. in an attempt to gain global exposure and boost its economy. Comparing a small nation to a mouse has since appeared often in literature when drawing the analogy of the little guy or dark horse overcoming insurmountable odds. This week, one very little creature has 'roared' its way into prominence as well, when it was discovered that it actually sported the genes of an elephant. 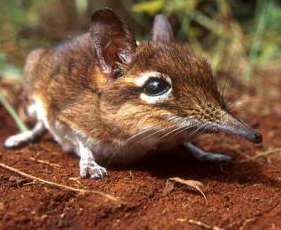 In the isolated region of Namibia, Africa, biologists have discovered a new species of the 'Sengi' or 'Elephant Shrew' that surprisingly has elephant DNA. In so doing, this not only gives this little unknown nation something to roar about, but also allots this adorable diminuative animal an opportunity to debut its existence to the world. Physically, this wee little creature is covered with a pinkish skin underneath its hair and a long, almost trunk-like "proboscis" -- which has been said -- can stick its little tongue several millimeters beyond the snout. Newly described in the Journal of Mammalogy, it's the smallest of the 19 known sengi species, coming in at only 7.3 inches long and weighing less than an ounce. Known to mate for life, scientists are now studying their monogamous relationships. They’re part of a clade of mammals including elephants, aardvarks and manatees called Afrotheria, named after the continent. Formally named the Macroscelides micus, the 'micas' species name comes from the Greek 'mikros' and apropos -- it literally means "small." 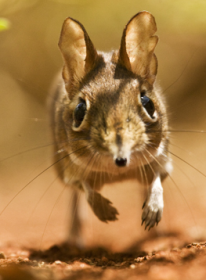 It's remarkable this species escaped detection for more than 100 years since the first sengis were found. And genetic analysis of the new specimens confirmed that they were significantly different from sengis studied earlier. Jack Du Jack Dumbachermbacher, a California Academy of Sciences researcher involved in the study, said, "Had our colleagues not collected those first invaluable specimens, we would never have realized that this was in fact a new species, since the differences between this and all other known species are very subtle." The new research also revealed that the species was more related to elephants and sea cows than to shrews or mice. It's been determined, that it is precisely the isolation of Naibia and the unique environmental conditions in that region which has given rise to this and other endemic animals. Equipped what some might term unique super-powers, these sengi can sprint at a very rapid pace, jump distances over three times their body length and only need to sleep for 2-3 minutes, at a time. So while these little micas might not have the vocal ability of their big cousins, the elephants, it does appear they do come equipped with some innate attributes found in much larger animals. Now, that's something to roar about! Is The Venezuelan Poodle Moth The 'Real McCoy'? 10 Weird Animal Defense Mechanisms -- The Animal Video of the Day!! !